The ACORN Team was out talking with students at September’s UTSU Street Fest. Members of the team spent the day at the festival and were visited by over 1000 thousand students, each of whom cast their vote on whether they preferred using ACORN or ROSI. 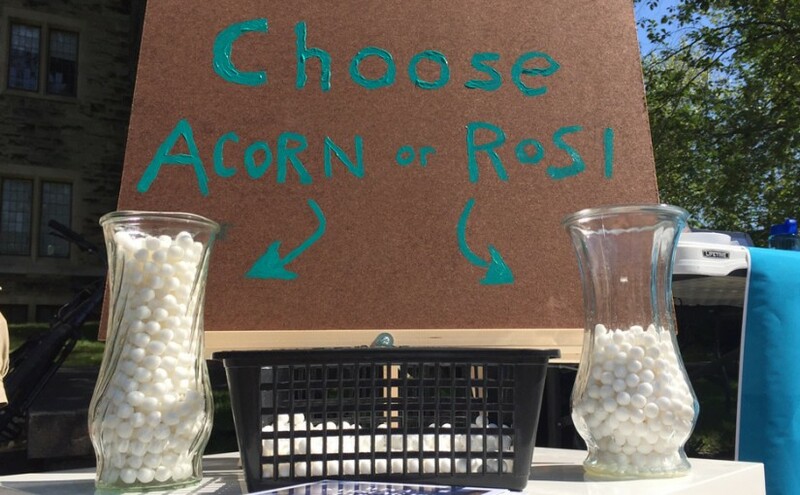 We spoke with many students about their experiences and gathered feedback on what worked well, what needs improvement, as well as their ideas for future enhancements to online services at U of T.
When the votes were tallied, ACORN came out the victor. Students told us they appreciate the enrolment cart (more on that in a moment), the clean new content layout, useful new functionality like timetable conflict warnings, as well as improvements to meta-information about courses and their current space availability. We’ll continue to keep refining the information that’s displayed to students about their academic and financial accounts to make it more timely, personalized and helpful. The majority of votes cast in favour of ROSI were due to infrastructure issues that kept ACORN offline for over an hour during a peak enrolment day. We are working towards ensuring this downtime will not occur again, via changes to the the ACORN web application, its underlying technical infrastructure, and real-world enrolment processes. Some upper-year students asked if they’d be obligated to transition to ACORN from ROSI. We’re happy to say that this will not be the case and students will have the opportunity to complete their final year of studies without switching to a new online student service (students will have the choice of using either ACORN or ROSI and switching between the two services at will until ROSI is eventually decommissioned after this academic year). Students spoke with the ACORN team about their experiences using ACORN and ROSI. We received a great deal of positive feedback regarding this new feature. We’re glad it’s been well-received by students! The ACORN team will continue to refine and expand on the capabilities of this feature, as well and work to ensure current and additional functionality is clearly explained to students. During the street fest we heard two common complaints about the timetable: The timetable was difficult to locate and, once discovered, it was difficult to differentiate between various courses making up each student’s timetable. We’ve since released updates to ACORN that have resolved both of these issues. The timetable can now be accessed via a link in the Academics section of ACORN’s main navigation menu. In the timetable itself, various courses are now distinguished with different colours (one colour per course). Students also raised questions regarding the “enrolment blocked” notice that appears in course enrolment pop-ups in various circumstances. In the future this notice will become personalized, timely and include specific information regarding what’s affecting students and their ability to enrol in a course (i.e. priority or restricted enrolment, enrolment controls affecting your campus, division or program of study, etc.). 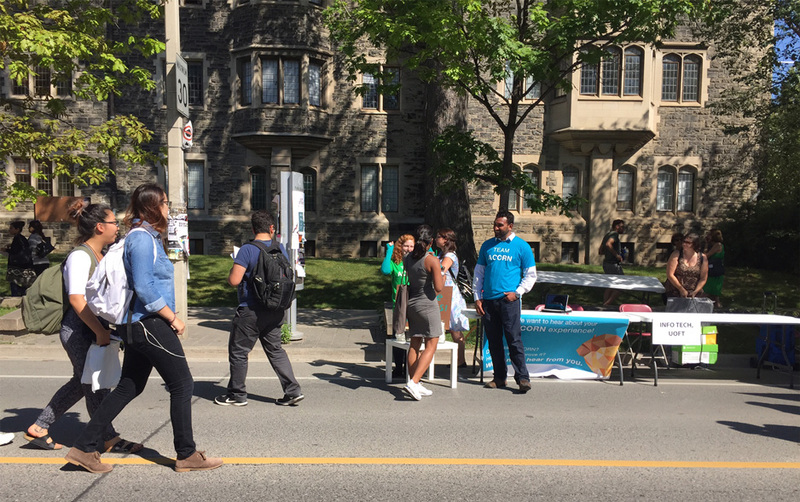 We thank everyone who offered their feedback during the street fest and took part in helping guide improvements to their online student services at U of T, and we encourage those who want to take an even more impactful role to join our student braintrust. You’ll be part of research exercises to determine the long-term expectations and priorities for ACORN, as well as participate in usability tests of functional prototypes and beta features that will assist the ACORN team adjust and refine these features before they’re released.